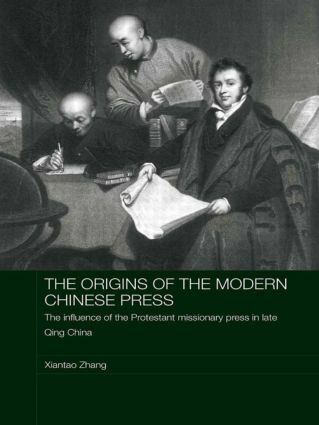 This book traces the emergence of the modern Chinese press from its origins in the western Christian missionary press in the late nineteenth century. It shows how the western missionaries and their evangelical/educational newspapers changed the long-standing traditional practices, styles, content, print culture and printing technology of Chinese newspapers and, in the process, introduced some of the key ideas of western modernity which were to have a profound effect on Chinese society. Xiantao Zhang demonstrates how missionary publications reshaped print journalism, rather indirectly, from a centuries-long monopoly by the state - the Imperial press - into a pluralized, modernizing and frequently radical public journalism. She focuses in particular on the relationship between the missionaries and the class of ‘gentry scholars’ - literati and civil servants, educated via the traditional state examination system in the Confucian classics, who were the prime target readers of the missionary publications. This key group and the independent press they established at the end of the nineteenth century played a crucial role in shaping the ongoing struggle for a modern democratic media culture in China. Xiantao Zhang is Research Fellow in the Institute for Cultural Analysis, Nottingham Trent University, UK. Previously a print and broadcast journalist in Beijing, she is currently researching issues in contemporary Chinese culture and media.